Kontaktovat nás můžete na e-mailové adrese viktoria_cistakova [at] nm.cz. Barceló, J. A. 2000: Virtual reality in archaeology. ArchaeoPress. Binks, D. – Dyke, J. – Dangall, P. 1988: Visitors Welcome. A manual on the presentation and interpretaion of archaeological excavation. H.M.S.O. Burke, H. – Smith, C. 2007: Archaeology to Delight and Instruct: Active Learning in the University Classroom. Left Coast Press. Clack, T. – Brittain, M. 2007: Archaeology and the Media, Left Coast Press. Fagan, B. 2010: Writing Archaeology, Second Edition. Telling Stories About the Past. Left Coast Press. Falk, J. H. – Dierking, L. D. 2013: The Museum Experience Revisited. Left Coast Press. Falk, J. H. - Dierking, Lynn D. 2013: Learning from museums : visitor experiences and the making of meaning. Walnut Creek. Gruber, M. 2009: E-Learning im Museum und Archiv. VDM Verlag. Hamilton, S. - Whitehouse, R. D. – Wright, K. 2007: Archaeology and Women: Ancient and modern Issues. Left Coast Press. Hein G. E. 1998: Learning in the Museum. Routledge. Hodder, I. 1997: Interpreting Archaeology: Findind Meaning in the Past Archeology, History, Heritage. Psychology Press. Holtorf, C. 2007: Archaeology is a Brand! : The Meaning of Archaeology in Contemporary Popular Culture. Left Coast Press. Holtorf, C. 2012: Search The Past - Find the Present. Qualities of Archaeology and Heritage in Contemporary Society. ArchaeoPress. Hooper-Greenhill, E. 1999: The educational role of museum. Routledge. Hooper-Greenhill, E. 2007: Museums and Education: Purposes, Pedagogy, Performance. Routledge. Chatterjee, H. 2008: Touch in Museums: Policy and Practice in Object Handling. Bloomsbury Academic. Chowaniec, R. 2011: Archaeological Heritage: Method of Education and Popularization. British Archaeological Reports. Jameson, J. 1997: Presenting Archaeology to the Public: Digging for Truths. Altamira Press. Johnson, A. 2009: The Museum Educator´s Manual. Altamira Press. 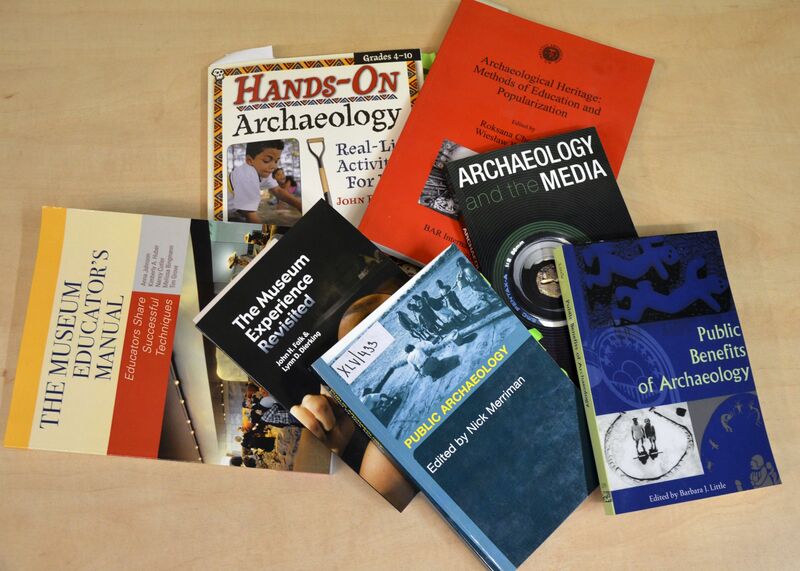 King, T. F. 2005: Doing Archaeology: A Cultural Resource Management Perspective. Left Coast Press. Layton, R. – Shennan, S. – Stone, P. 2006: A Future for Archaeology. The Past in the Present. Psychology Press. Little, B. J. 2002: Public Benefits of Archaeology. University Press of Florida. Little, B. J. 2007: Historical archaeology: why the past matters. Left Coast Press. McGregor, T. 2007: Comprehension Connections: Bridges to Strategic Reading. Heinemann. McManus, P. 2000: Archaeological Displays and the Public Museology and Interpretation. Archetype Publications. Merriman, N. 2000: Beyond the Glass Case. The Past, the Heritage and the Public. Left Coast Press. Merriman, N. 2004: Public Archaeology. Routledge. Norris, L. - Tisdale, R. 2013: Creativity in Museum Practice. Left Coast Press. Paardekooper, R. 2013: The Value of an Archaeological Open-Air Museum Is in Its Use: Understanding Archaeological Open-Air Museums and Their Visitors. Sidestone Press Dissertationes. Paris, S. G. 2002: Perspectives on Object-Centered Learning in Museums. Taylor & Francis. Pepe, P. – Zarzynski, J. 2012: Documentary Filmmaking for Archaeologists. Left Coast Press. Pye, E. 2008: The Power of Touch. Handling Objects in Museum and Heritage Contexts. Left Coast Press. Schmidt, M. - Wunderli, M. 2008: Museum experimentell: Experimentelle Archäologie und museale Vermittlung. WochenSchau Geschichte. Skeates, R. – McDavid, C. – Carman, J. 2012: The Oxford Handbook of Public Archaeology. Oxford University Press. Waterton, E. – Smith, L. 2009: Taking archaeology out of heritage. Cambridge Scholars. White, J. R. 2005: Hands-On Archaeology: Real-Life Activity. Prufrock Press.